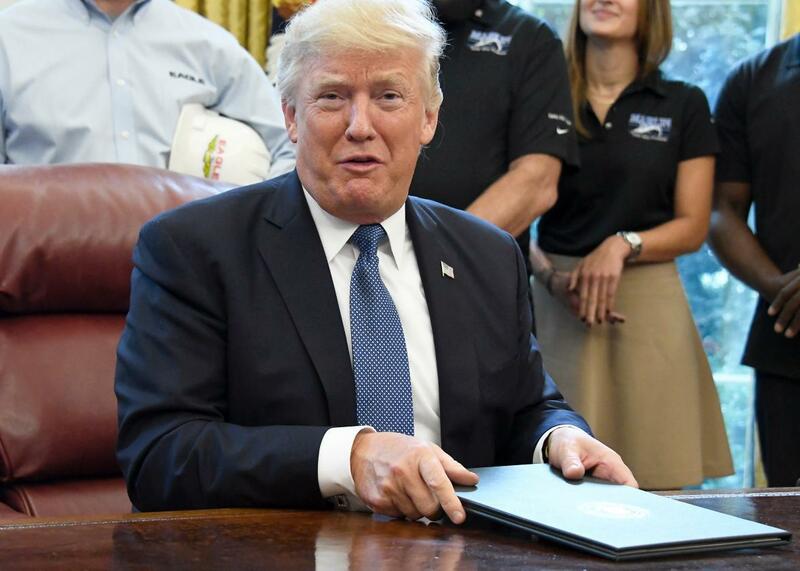 President Donald Trump responds to reporters after signing a National Manufacturing Day Proclamation in the Oval Office of the White House on October 6, 2017 in Washington, D.C. It may have helped give rise to conservative talk radio, as stations were no longer obligated to cover all sides of a controversial topic. While some groups on the left have called for it to be reinstated over the years, many Republicans have actually warned against any efforts to do so. The equal-time rule is still in place, but it applies to appearances of political candidates on broadcast outlets, not whether a comedy skit or monologue targets a president or Congress. Moreover, news coverage and interviews are exempt, and over the years, when the issue has come up, that has been ruled to include late-night talk programs. Mike DiCenzo, a writer and producer at the Tonight Show With Jimmy Fallon, kindly explained to the president “that’s not how it works” as the rules are different when campaigning. “Now kindly stop tweeting nonsense and go do your job for once,” he wrote.